Remember David and Goliath, that familiar Bible story we were taught in Sunday school? We smile as we remember the flannel board display of this childhood story. Maybe you can even recite how the story unfolds: The young David, with sling and stone in hand, walks up to Goliath, trusting God, and lets loose the shot that caused the huge giant to fall. But the story of David and Goliath is so much more than flannel board and familiarity. It truly happened. It was a real war, with real men defending their own country. David was just a boy, never skilled or trained in war, and Goliath really was a fearful giant. Step out of the familiarity and put yourself in David’s shoes for a moment. Can you imagine how he must have felt when he spoke to his king about victory, only to have the king laugh in his face at his “youthful courage”? Picture yourself in a battle for the first time, your countrymen watching you as you’re armed with a childhood toy. Hear the opposing troops chuckle as you pull out your slingshot and grab a stone from your pocket. Watch as some of your countrymen bow their heads in embarrassment as they see you ready your sling. The moment of truth is at hand. How sweaty your palms must be as they steady the shot. There’s no turning back now—this is all or nothing. The story of David and Goliath is truly amazing! 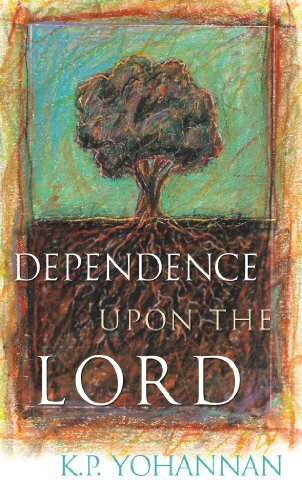 It’s a remarkable display not only of God’s faithfulness, but also of David’s incredible dependence upon the Lord. David had absolutely nothing to rely on—not a weapon, not experience, nothing. The only thing he depended on was the ability, faithfulness and power of God. And that was enough! He killed the giant that day—not because of his strength or his plan, but because he was depending upon God to give him the victory. God desires to do the same in our lives as well, if we would only trust, lean and rely fully upon Him. Like David, we do not need to have a long list of credentials to qualify us to be used by God—simple dependence upon Him will do. Second Corinthians 4:7 says, “But we have this treasure in earthen vessels, that the excellence of the power may be of God and not of us.” The treasure spoken of in this verse is God within us. All the treasures of heaven are ours as a gift, to partake of and share with others but held in simple “earthen vessels”—you and I. The NIV translation calls us “jars of clay.” God wants us and the world to know that the treasure, the power and everything good that flows out of our lives come from Him, not from us. The jar of clay cannot produce water in and of itself; it can only be used to pour out what it has been filled with. God’s treasures flow out of us as we depend upon Him, the source of all good things. Even though we live in a world today in which people are professionals and specialists, with doctors trained to do only certain types of surgery and Ph.D.s with a lot of knowledge in one specific area, God still looks past credentials, searching above all else for a heart that will depend upon what He can do. In fact, all throughout Scripture it seems God uses the foolish things of this world to confound the wise. That’s exactly what 1 Corinthians 1:27 (KJV) says, “But God hath chosen the foolish things of the world to confound the wise; and God hath chosen the weak things of the world to confound the things which are mighty.” Numerous times, God finds an ordinary man or woman whose heart is fully dependent upon Him and works through that person in extraordinary ways, showing His power and might and bringing Him alone the glory and honor. For example, a couple of years ago at our Bible school in Bangladesh, one man who served as a cook at the school desired to enroll in classes so that he could become a missionary. His heart for the Lord was great, but unfortunately, he did not meet the minimum education needed to be admitted into our Bible school. When the head principal heard about the cook’s desire to serve the Lord but that he was unable to attend the school, he told the cook that if he wanted, he may sit in on the Bible classes after he finished his cooking duties. The cook was thrilled with this idea. So every morning and afternoon, as soon as he finished all his responsibilities in the kitchen, he attended bits and pieces of as many classes as he could to learn as much as possible. Soon the school year was coming to a close, with 18 smart, strong, young men ready to graduate from the Bible school and start their mission work. But the first new church in the area was not planted by one of the graduates. The first church was planted by the cook! And after he planted his first church, he turned it over to one of the graduates and went off to start another! A classic biblical example of God using an ordinary person is found in the life of Noah. Never having built a boat before, Noah had absolutely zero qualifications to do so. But in Genesis 7:5, we find out why Noah was successful in the ark’s construction: “And Noah did according to all that the LORD commanded him.” Because Noah completely depended upon the Lord to show him what to do, the ark withstood 40 days of the greatest storm the world has ever known. The boat held up against all the beatings of the storm and finally came to rest, with all its animals safe and sound. The Titanic was built by men who knew what they were doing. It was specially designed by experts to be unsinkable. Men bragged about the wonderful ship they had built. Yet on its first voyage ever, it ran into an iceberg and went down in the Atlantic Ocean. Hundreds of men, women and children drowned in the ice-cold sea. From David to Noah, we see that the only qualification to be used by God is absolute dependence on Him. These men were simple, yielded vessels looking to God alone, never relying upon mere human strength, experience or skill. Because of that, God was able to display His greatness through their lives. © 2003 by KP Yohannan, the president and founder of Gospel for Asia. It was written with the intention of encouraging and edifying the Body of Christ. To learn more about Gospel for Asia or to receive additional free resources, visit Gospel for Asia’s website. This entry was posted in Dependence Upon the Lord and tagged Bible, Christianity, Discipleship, encouragement, gfa, Gospel for Asia, holy spirit, Hope, Jesus, Jesus Christ, K.P. Yohannan, kingdom of God, living water, Missionaries, Missions, service on June 22, 2010 by gfaseo.